TAXES: President Donald Trump’s tax reform proposal could be one of the biggest overhauls in decades, and for the most part Vermont Republicans support it. 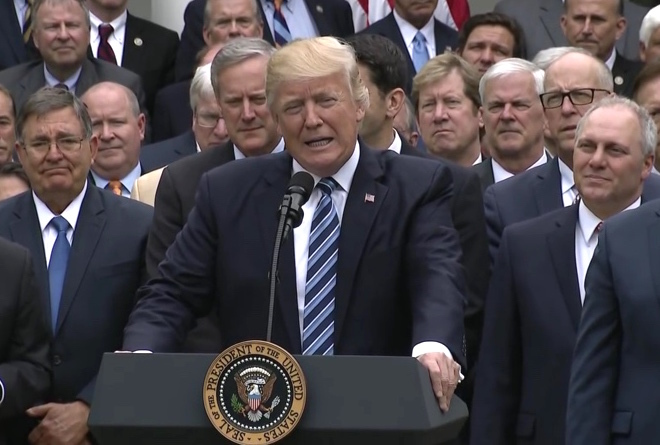 President Donald Trump has released his tax reform plan, and in a rare display of party unity, Vermont Republicans seem to be strongly behind their leader. “Vermonters continue to struggle with kitchen table issues under the burden of the state and federal tax system. We believe President Trump’s plan will help Vermonters keep more of what they earn,” Jeff Bartley, executive director of the Vermont GOP, said in a statement. One of the big changes proposed is a simplification of the tax brackets down from seven to three, including rates of 12 percent, 25 percent, and 35 percent. So far 48 percent of Americans support president Trump’s proposal, according to a POLITICO/Morning Consult poll. Bartley said that’s why Vermont’s congressional delegation needs to step up with support. “We applaud the President for kick-starting this long overdue conversation and urge Senator Leahy, Senator Sanders, and Representative Welch to finally come to the table and discuss meaningful bipartisan tax reform. Vermonters deserve relief,” Bartley wrote. Trump himself called for bipartisan support for the plan during a recent stop in Indiana. “Democrats and Republicans in Congress should come together to deliver this giant win for the American people and begin the middle-class miracle once again, also called a miracle for our great companies,” the president stated. According to the poll, 62 percent favor doubling the standard deduction to $12,000 for individuals and $24,000 for families. Also, 61 percent favor reducing the maximum small-business tax rate to 25 percent from 39.6 percent. And 61 percent also favor creating a $500 tax credit for all dependents such as grandparents and disabled, and 60 percent support increasing the child tax credit from $1,000 to an unspecified amount. Vermont Rep. Marianna Gamache, R-Swanton, said she’s heard enough to generally be in support. “The middle class, especially a substantial number of small business owners and operators, are getting clobbered with taxes and regulations,” she said. She added that a compression of tax brackets sounded like a good thing, with so much complication and loopholes in the current system. On the subject of taxes, she added it was disappointing that Trump has not yet been able to repeal Obamacare. Assistant House Minority Leader Brian Savage, R-Swanton, offered his take. “I’m a firm believer that we’ve depended on too much federal money for too long to fund various aspects of our state and government,” he said. Savage said the extra money in people’s pockets should translate into a spurred economy. Savage said he wishes someone would propose a flat tax, not unlike what President Ronald Reagan proposed 35 years ago. He said everyone needs to keep in mind this is just the beginning of the process. Already Vermont’s congressional delegation has weighed in. U.S. Sen. Patrick Leahy, a Democrat, took a jab at Trump’s personal income when asked about the plan. Sen. Bernie Sanders, an independent, said the new plan would benefit the rich. I’m not from Missouri, the show me state, but I will believe it when I see it. What does your comment have to do with anything? When I see them actually pass tax reform, then I will believe it.